The Stonington Madrigal Singers presents “Carols from the Old and New Worlds” on Saturday, Dec. 8th at 7 PM. Featured are old American settings of traditional Christmas songs and Renaissance music of Europe, composers from New England--Daniel Read, William Billings, and Samuel Holyoke—along with beautiful motets of Gallus, Byrd, and Praetorius. The singers are joined by the Stonington Recorder Consort in this delightful introduction to the holiday season. The concert is at Calvary Church in Stonington borough. Reception to follow. Donations gratefully accepted. For more information call 860-535-3631. Beginning students will learn the essentials of acoustic guitar playing in a supportive group, with guidance and instruction by our outstanding guitar teacher, James Harris. Students must provide their own guitars. 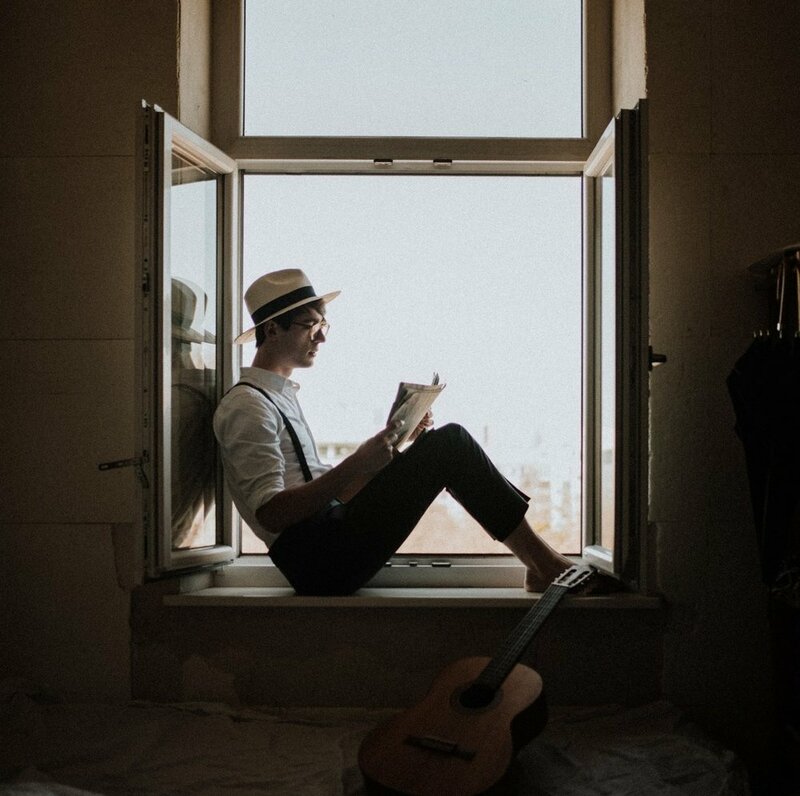 Learning to read music is like learning a new language. 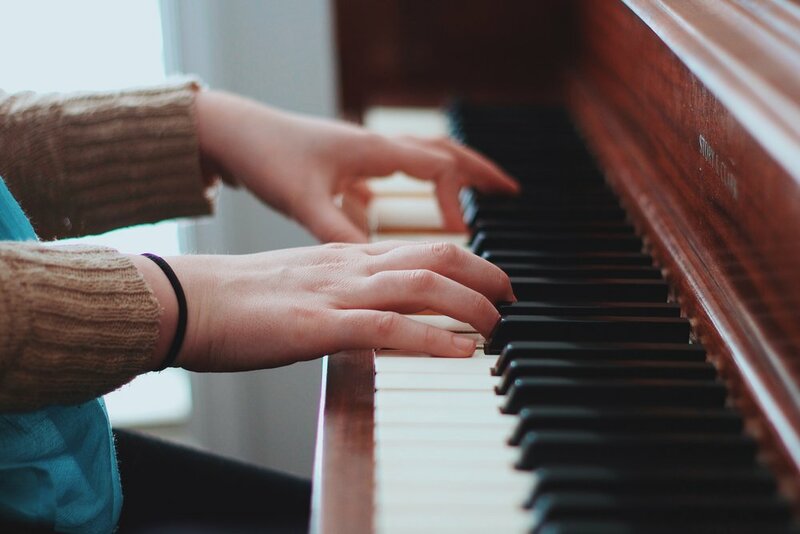 This course will help you understand the basics of notated music; its vocabulary and symbols; to understand rhythm, pitch, melody, harmony, and expression. This course is taught by Calvary Music School's Interim Artistic Director Robert Guarino. It is open to teens or adults with little or no prior knowledge of reading music. How to Listen to Classical Music will help ease you into this sometimes intimidating world. Through guidance and exposition, participants will receive an overview of different musical styles, eras and composers. Music Fundementals is for students that perhaps play an instrument "by ear" or just want to read basic notation and get a feel for the language of music. The Stonington Madrigal Singers presents Christmas Music of the Tudor Court. This delightful program features music performed for the English monarchs including Henry VIII, Queen Mary, and Queen Elizabeth I. The Singers are joined by guest artists Allyn Bryson Donath, harpist, and Evan Anderson, soprano, in works of William Byrd, Thomas Tallis, Richard Pygott, and Christopher Tye. Concerts are on Sunday, Dec.4 at 5 PM at Crossroads Presbyterian Church in Waterford and Friday, Dec. 9 at 6 PM in Calvary Church, Stonington. A reception follows each concert. Donations at the door gratefully accepted. For further information call the Calvary Music School at 860-535-3631. Calvary's Annual Messiah Sit & Sing 2016! Calvary’s Annual Messiah Sit & Sing 2016! On Saturday, December 3rd at 3:00 p.m., join your friends at Calvary Church in Stonington, CT and the Mystic River Choral for Calvary’s Annual Messiah Sit & Sing! Bring your own score or borrow one of ours. Audience members can sit in their respective sections (soprano, alto, tenor, or bass) or simply sit and enjoy the music. Directed by Frank Martignetti and accompanied by organist Joseph Ripka, the sit & sing will feature soloists Eden Casteel, Margaret Tyler, Jack Pott, and Paul Laurence Fletcher. Suggested donation at the door is $10. Mulled cider will be served in the courtyard following the sing. All are welcome! www.calvary-stonington.org. Stars, Stripes & Strings! American Music for the Glorious Fourth. A short concert of patriotic music including John Philip Sousa's "Stars & Stripes Forever" for one piano and six hands! Sponsored by the Stonington Historical Society, the performance takes place at Calvary Church immediately following the parade and reading of the declaration of independence. Calvary Music School Instrument Petting Zoo. Hosted by the Stonington Free Library, CMS will offer its annual Instrument Petting Zoo to give potential students a chance to try different instruments and meet with teachers. The Petting Zoo will also include a free mini-concert performed by faculty. FREE and open to the public. 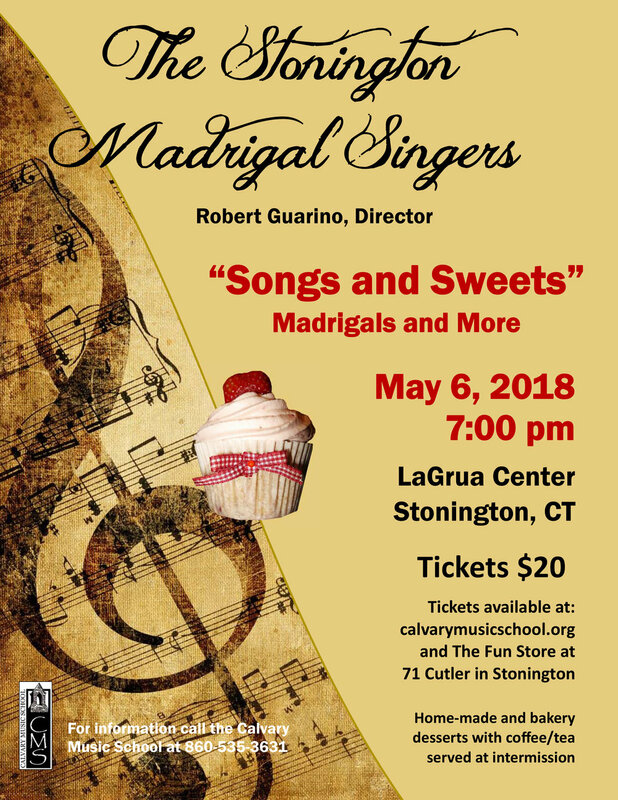 Stonington Madrigal Singers: "The Seven Ages of Man"
Calvary Music School presents The Stonington Madrigal Singers in “The Seven Ages of Man”—a tribute to William Shakespeare. April marks the 400th anniversary of William Shakespeare’s death at the age of 52. The program of madrigals and rounds vividly describe a person’s journey through the different stages of life—birth to old age and is based on the famous monologue, “All the world’s a stage…” from his comedy, As You Like It. 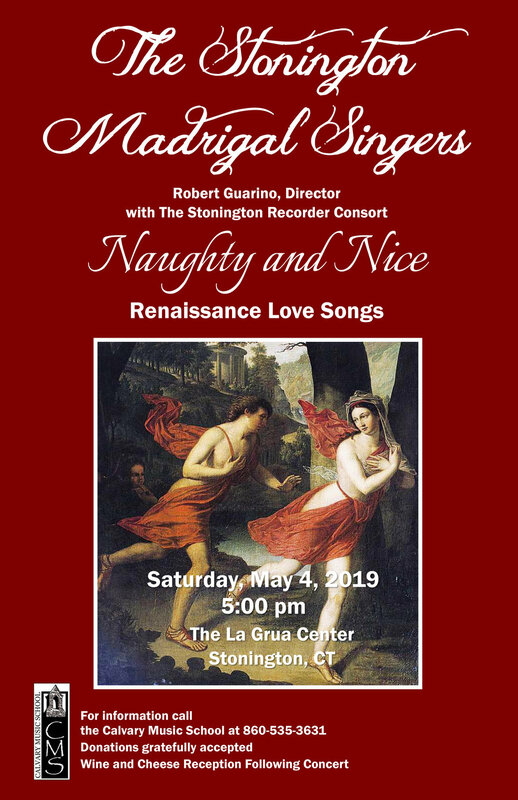 The madrigal singers will be joined by the Stonington Recorder Consort for this delightful program at the La Grua Center in Stonington borough on Saturday, April 30th at 5 PM. There will be a reception following the concert. There is a suggested donation of $10/person. 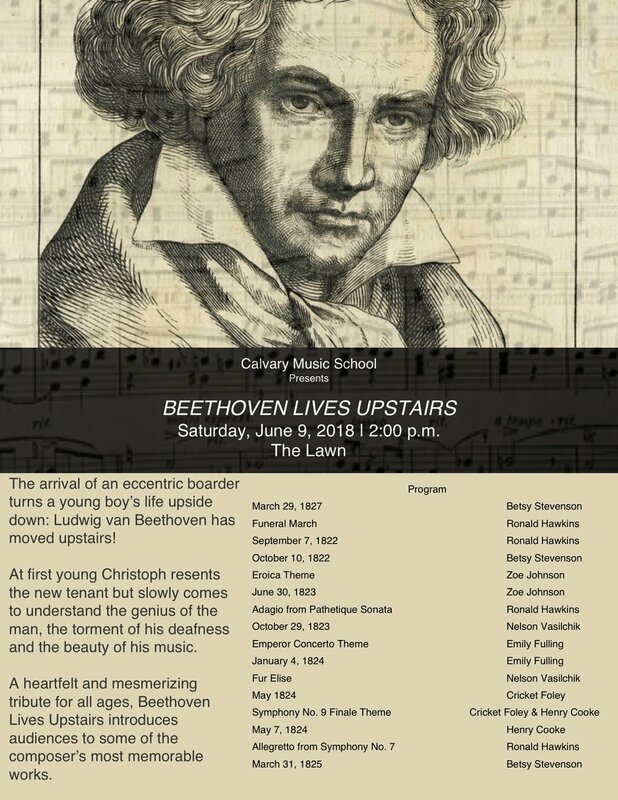 For further information please call the Calvary Music School office at 860-535-3631. This concert will feature CMS students at the La Grua Center in Stonington. Free and open to the public. Take a journey through the history of double reeds, experiencing music from the Renaissance to the present. Learn how the double reed works, the interesting timbre of the instruments, and what makes the double reeds unique and fun to play. Recommended for youth grades 4 – 8 and families. Performed by the Laurel Double Reed Ensemble. Student recitals will be held in the church at 1 p.m. and 3 p.m. on Sunday, December 13th. Celebrate the holiday season! The Stonington Madrigal Singers will be joined by the New London Brass Quintet in a concert of medieval and renaissance Christmas music. Works include familiar early carols—Lo, How a Rose E’er Blooming and Coventry Carol—as well as the hauntingly beautiful motet, O Magnum Mysterium. Another highlight features the Madrigal Singers performing Three Spanish Christmas Carols of the 16th Century, edited by Noah Greenberg, one of the founders of the New York Pro Musica. The New London Brass Quintet will add a festive tone in their short works for brass and accompanying some of the vocal selections. The concert will be at the Calvary Church on Friday, December 11 at 6 PM. Donations will be gratefully appreciated. Join us for the 4th annual concert of patriotic music at Calvary Church. The program is usually entitled "Stars, Stripes, and Pipes!" but as we are currently without a pipe organ, we've revamped the program a bit. Music will include favorite Sousa marches arranged for 4 hands on the piano with Joseph Ripka & Ronald Hawkins. Charles Ives "Variations on America" for violin and piano. (Erin Ripka, violin), and some audience sing-a-long selections. The concert starts right after the festivities on Wadawanuck Square (approx 11:30 a.m.) FREE! CMS spring recital at Calvary Church. Reception follows.